Smash and grab Subway restaurant burglary with a stolen pickup truck on Euclid Avenue near Salt Creek Lane. Arlington Heights firefighter/paramedics responded about 3:26 AM Friday, November 3, 2016 to an activated fire alarm at 2942 West Euclid Avenue Arlington Heights, IL. Firefighters on the scene requested police respond to the scene after they discovered it appeared a vehicle drove through the front of the Subway restaurant at 2960 West Euclid Avenue. There was no fire at the location. Firefighters reported a lot of damage at the scene at the Esplanade of Arlington Heights strip mall at the northeast corner of Euclid Avenue and Salt Creek Lane. 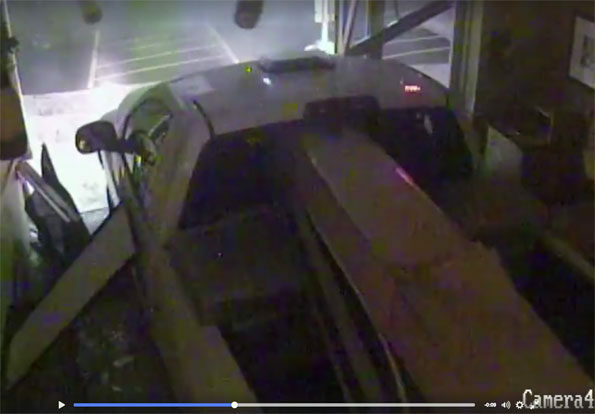 The Arlington Heights Police Department investigated the burglary and determined with surveillance video that unidentified offenders used a stolen pickup truck to drive through the front window of the business. The truck was immediately driven out of the restaurant after being driven full-length of the vehicle into the restaurant. After the crash, two offenders entered the restaurant on foot and stole numerous items, including an undisclosed amount of currency. The vehicle, stolen in Mount Prospect, was later recovered in Hanover Park, IL. The Arlington Heights Police Department is requesting the public’s assistance in identifying the offenders. Arlington Heights Police released information about this crime on Friday November 11, 2016 at 02:29 PM — about 203:03 (hours: minutes) or about 8 days after the crime was discovered. Please note: The elapsed time of police notification to the public is based on an estimated crime report time. Anyone having information about this or any other serious crime in Arlington Heights can call the Criminal Investigation Bureau at 847-368-5300, submit an anonymous tip via text or by telephone: Text keyword 847AHPD and your message to 847411; or call Arlington Heights Crime Stoppers at 847-590-STOP. Callers are guaranteed anonymity and may qualify for a cash reward of up to $1,000.